Summer is the time of year where snakes are on the move and are at their most aggressive. If a snake bites your dog the treatment you give on the way to the vet could be the difference between life and death. Brown Snakes, Tiger Snakes and Black Snakes are the most important venomous snakes, so watch for the following symptoms. If you think your dog has been bitten, seek prompt attention from your vet. Your local veterinary surgeon should be aware of the types of snakes found in their district and would generally have access to the antivenenes for these. Inquisitive nature or fun in puppies and young dogs. The snake may be no more than a rustle in the grass but the dog can not resist chasing the sound and pouncing up and down in the grass searching for the source, or the snake may be in the open and the dog considers it something to play with. In either case the snake may behave in a defensive way by biting. Although older dogs are similarly at risk, they are often less interested. However, the following behavioural trait is more likely to manifest itself in older dogs. Hunting and territorial behaviours are to some extent breed-specific. If a snake moves through the yard these dogs are quick to attack it. In many cases they are successful, however, as a dogs reflexes slow down with age there is an increasing likelihood of snakebite. Cats are natural hunters and often find snakes. A problem to owners of snake-catching cats is their habit of returning home with a live snake. Little will discourage cats from hunting snakes. Snake venom has six major components. The signs of snakebite vary according to the relative strength of these components in the venom of each type of snake. Myotoxins cause damage to muscles both locally at the site of the bite and throughout the body. Hemotoxins damage the lining of blood vessels (vascular damage) resulting in bleeing. Coagulants cause clots to form in blood vessels throughout the body. Eventually this leads to an inability to clot (coagulopathy) as the supply of clotting factors becomes exhausted. 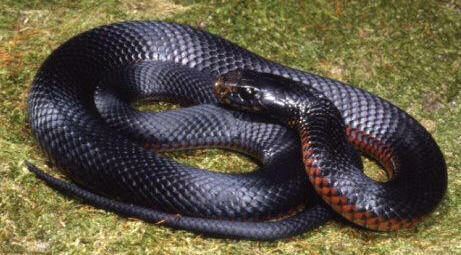 The Coral Snake, Australian Brown Snake, Tiger Snake, Taipan and Death Adder venoms are predominantly neurotoxic. In early stages the animal may look uncoordinated, with twitching, excessive salavation. Pupils will fluctuate in size before becoming fully dialated and unresponsive to light. More severe cases progress to flaccid paralysis (collapsed and floppy). Other symptoms may include – trembling, sweating, vomiting, excitability and/or collapsing a few minutes after being bitten. Death usually results from paralysis of the respiratory muscles causing inability to breathe. 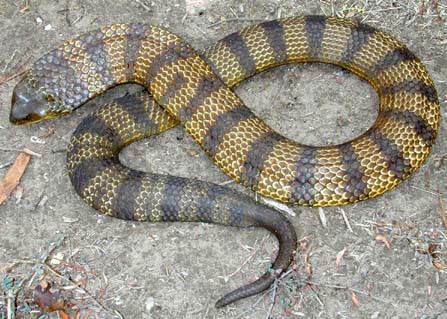 BROWN snake – weakness, collapse and initial hindquarter paralysis which progresses to forequarter paralysis are classic symptoms of brown snake bites. The animal may make attempts to move, but does not appear to have any strength and collapses again. If untreated paralysis of the respiratory muscles causes respiratory failure and death. There may be paralysis and lolling of the tongue and also the throat muscles, leading to voice loss, however, before paralysis sets in, the animal may initially appear excited, distressed and panting. Vomiting, especially with traces of blood, is a poor prognostic sign and indicates urgency. TIGER snake – The signs are similar to that of the brown snake but often with more excitement, more chance of vomiting and being abnormally twitchy and sensitive to stimulation. It is often impossible to distinguish clinically between brown and tiger snake poisoning. 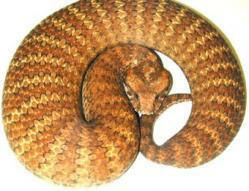 But it is of critical importance as far as treatment goes because the brown snake antivenene does not help tiger snake bite and visa versa. BLACK snake – The neurotoxic (nerve affecting) effects of black snake bite are much less pronounced, Black snake venom affects the blood and tissues more severely. The most important signs are weakness with pale mucous membranes, sometime haemorrhages in vomit or diarrhoea and a lesser degree of paralysis and incoordination. 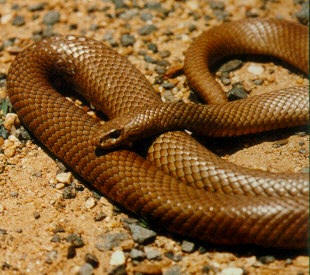 DEATH ADDER snake – Although Death Adders and Mulga Snakes are widespread in Australia they are rarely involved locally. In all cases of snakebite the correct antivenene in adequate dosage (the dose is not dependant on animal size but on the amount of venom injected) gives an excellent chance of recovery if administered in time. Supportive treatment includes corticosteroids, antibiotics (snakes mouths are dirty), intravenous drips, hot water bottles etc. Most fatalities do not occur quickly. Most occur 6 hours or more after being bitten. A small percentage of bites will be rapidly fatal. In these cases the animal is usually dead before any chance of help is available. These are usually cases of multiple bites or bites into the bloodstream or adjacent areas. If unsure as to which type of snake has bitten an animal there is a combined bown/tiger snake antivenene. However, it would be worth checking if your local vet stocks the combined and/or tiger or black snake antvenene. Snakebite treatment is successful in over 80% of cases. Dogs are more susceptible to the venoms of snakes than cats. If it involves a large venomous snake then the prognosis is rarely good. Even so, if there are signs of life, with the correct antivenene dogs can make a remarkable recovery. Often it is the case with work dogs on the farm that death occurs in the vehicle on the way to town. If the dog is in an advanced state of collapse do not hesitate in getting it to the vet. Seek veterinary treatment immediately – ring ahead if possible to ensure the correct antivenene is available. In warm weather be aware of snakes when you are out walking, especially brown snakes which is the most common snake bite to dogs. It is advisable to restrain your dog on a leash, otherwise if the dog is exercised, choose an open area where you can have visual contact with it always. Most snake bites to humans occur when people are trying to either catch or kill a snake. Snakes are a protected species.